While trading was ushered in through the Silk Road, so was Buddhism from India. Buddhism encourages people to learn to get rid of self-interest and self-centeredness. With the aid of meditation and right living, Buddhists believe that they can reach Nirvana, a state that is absent of suffering. Serious Buddhists use very strict codes of ethical conduct to strengthen and enlighten themselves, often with many mental and physical exercises. Buddhism was founded by Siddharta Gautana in India about 2,500 years ago. 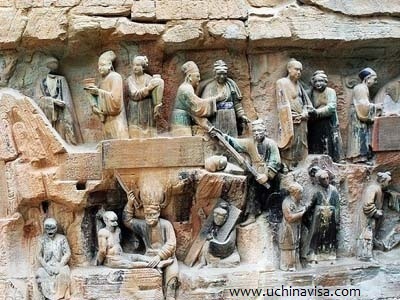 When Buddhism arrived in China during the Han Dynasty (202 BC-220 AD), it was considered as a part of Taoism. The effort of a number of Indian Buddhist monks kept the religion from being swallowed by Taoism. 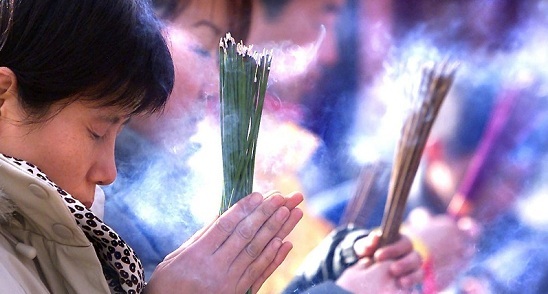 The Chinese altered Buddhism somewhat anyway, and Buddhism made its way to become a major religion in China. Taoism, Confucianism and Buddhism are the big three religious philosophies in China. They did not always agree, but were not intolerant neither. In fact, all three influence one another in some ways. Further more, due to the tradition of Chinese polytheism; the three are sometimes worshipped altogether. The following are a couple examples. 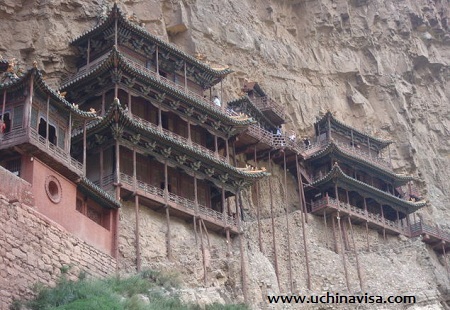 Hanging Temples on Mountain Heng (Hengshan) in Huiyuan, Shanxi Province. One of them is called The Hall of Three Religions, where Buddha, Laozi (Lao Tzu), Kongzi (Confucius) are worshipped together. Da Zu Grotto (Dazu rock carvings) in Chongqing, Sichuan. These statues were carved between 10 - 13 centuries. Daoism, Confucianism and Buddhaim figues are equally presented. Da Zu Grotto (Dazu rock carvings) in Chongqing, Sichuan. Buddhism Figures. Da Zu Grotto (Dazu rock carvings) in Chongqing, Sichuan. 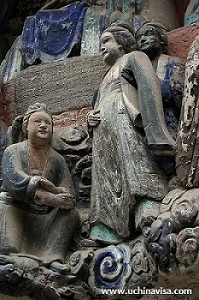 Taoism Figures. 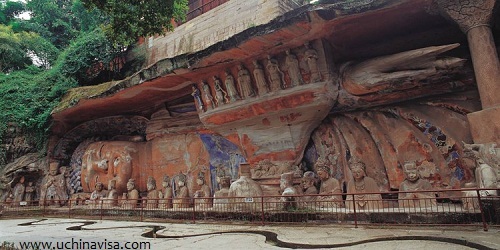 Da Zu Grotto (Dazu rock carvings) in Chongqing, Sichuan. Confuciuanism Figures.